A project to maximise the space within a round room, making the most of the curves yet maintaining the amount of light to create a welcoming library space. West College Scotland, as the name suggests, is a college designed to cater for the entire West of Scotland. Main campuses are Clydebank, Greenock and Paisley, each of the campuses featuring great teaching and state of the art facilities. The existing library was in another building on the Paisley campus in a large high-ceilinged room with shelving surrounding a single study space. The plan was to move to a smaller (and rounder) space within the main college building and to provide a more welcoming environment for the students. The challenge was to provide the same storage capacity for books while also allowing for study space and working space for librarians without blocking the natural light coming through the floor-to-ceiling windows. One particular feature was to provide storage for information leaflets on personal issues which would be situated away from the main area and out of view of the librarian’s desk to allow students to access this material discreetly. 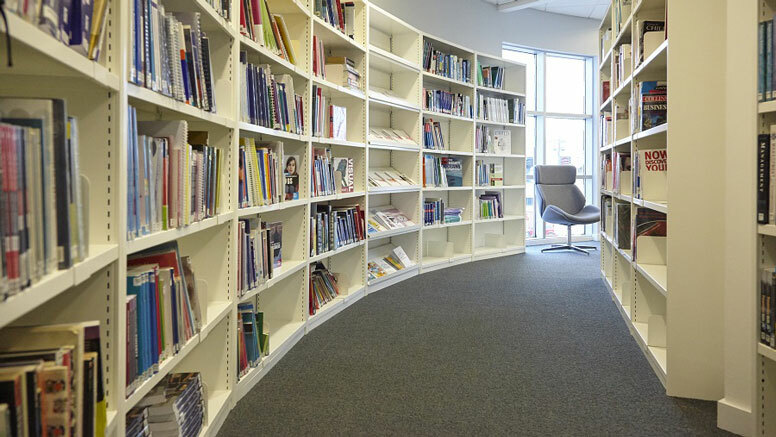 The project was carried out by Rackline, who installed a total of twenty seven bays of Proform static shelving – many individual bays to allow the units to fit around the curve in the room. The bays were designed in different heights and widths to suit the overall layout of the library. Twenty six of the bays had standard shelves and an adjustable divider on each level, and one bay was designed with lift-up journal shelves to store and display leaflets. The finish was Pure White (RAL 9010) with decorative tops on the lower level bays to ensure a finished appearance. Creating a circular shelving system - a case study.